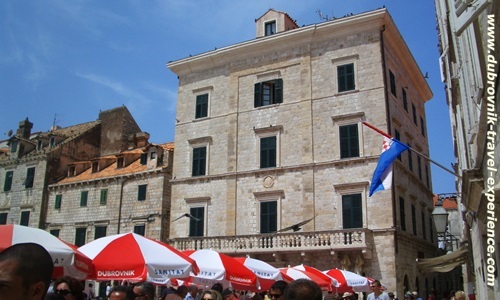 This exclusive 5-star hotel is located on the beautiful Gundulic Square, in the very centre of the historic Old Town. Stradun Street, filled with outdoor cafés and restaurants is only a minute's walk from the hotel. Dubrovnik's most attractive beach, Banje beach, can be reached on foot from the Pucic Palace Hotel. 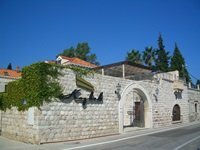 Hotel offers exclusive accommodation in the hotel and the Pucic apartments. The Pucic Palace Hotel has 17 deluxe and executive guest rooms and 2 suites. The hotel guest rooms are furnished with antique furnishings and modern conveniences and feature dark oak parquet floors with hand-made rugs, warm tones, classic and contemporary artworks by local artists and double paned soundproof windows. Room amenities include air-conditioning, en-suite bathroom, mini bar, satellite TV, DVD player/CD player (with CD/DVDs for rent), safety deposit box, hair-dryer, bathrobes and slippers, excluisve toiletries (Bvlgari), direct dial phone and free Wi-Fi Internet access. Apart from the main hotel's building there are Pucic apartments located in a baroque building just around the corner. There are 4 accommodation units, two apartments and two double rooms that can be booked separately or combined. The Pucic Palace Hotel Dubrovnik offers three elegant dining venues: Café Royal, Defne Restaurant and Razonoda wine bar. The Café Royal is an excellent place to enjoy fine dining, serving international specialities. The Defne restaurant is located on the hotel's open-air terrace surrounded by jasmine trees and citrus flowers. It offers seafood-based Mediterranean cuisine with Dalmatian dishes such as octopus salad, risotto and plenty of fresh fish. The Razonoda wine bar offers an extensive list of international wines. A high-quality selection of tobaccos and cigars are available. The menu at the Razonoda bar features traditional delicacies, such as homemade cheese and Dalmatian smoked ham. Although the Pucic Palace Hotel Dubrovnik is situated in the very heart of historical Dubrovnik, you will only need a five-minutes walk (300 m) to the most attractive city beach, the Banje beach. The East West Beach Club, which is located on the beach, features a separate area for the guests of the Pucic Palace hotel with complimentary deck chairs and parasols. The island of Lokrum, located just 0.5 km from the Old Town, is a perfect spot for boat trips during hot summer days. The boat to Lokrum departs from the Old Harbour which is located only 2 minutes' walk from the Pucic Palace. At the hotel they can arrange a private yacht for guests to discover the breathtaking Dalmatian coast. Free Wi-Fi Internet access is available throughout the hotel. If you are arriving by car, public parking is available at a location nearby (reservation is needed) and charges are applicable. Hotel can easily be reached from Dubrovnik airport. The airport shuttle bus will drop you off at Pile Gate which is 5 minutes walk from the hotel. If you arrive by car, you should inform the hotel and they will arrange parking (charge fee) outside the city walls. From main bus station you need to take any bus running to Pile Gate.